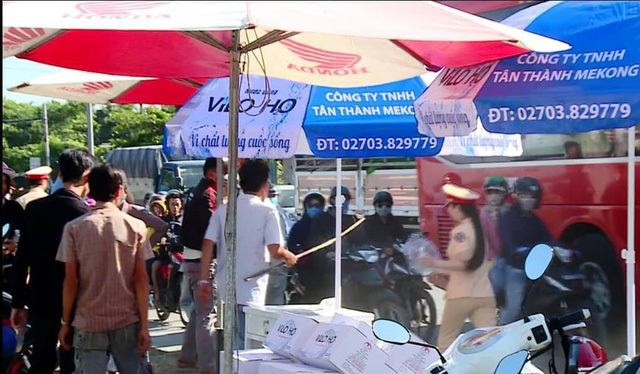 This still photo taken from a Facebook video shows a man holding a stick attempting to ask police officers to stop giving free drinking water next to his roadside beverage shop in Vinh Long Province, southern Vietnam, on February 10, 2019. A Vietnamese man prevented police officers from handing free bottles of drinking water to passing motorcyclists on Sunday, the last day of the week-long Lunar New Year (Tet) holiday, as people from the Mekong Delta rushed back to Ho Chi Minh City for work. On a section of the national highway passing Vinh Long Province, local traffic police officers on Sunday set up a ‘free water station’ to help those heading to Ho Chi Minh City quench their thirst in the sweltering heat. Motorcyclists greeted the deed with gratitude but the owner of a roadside beverage shop at the location was unhappy. The man is seen in a video posted on Facebook using a stick to force the police officers, mostly females, to cease giving the free water in front of his house. He also broke and pushed water bottle boxes to the ground, according to the video seen by Tuoi Tre News. A man holds a stick attempting to ask police officers to stop giving free drinking water next to his roadside beverage shop in Vinh Long Province, southern Vietnam, on February 10, 2019, in this video taken from Facebook. Witnesses told Tuoi Tre (Youth) newspaper that the man was vexed as the police’s offering free water dented the income of his home-based beverage shop there. A leader of the traffic police unit under the provincial police department confirmed to Tuoi Tre that the incident took place on Sunday, adding that the aggressive man insisted that the police officers were placing the items on the land he owns. More police officers were then dispatched to the scene and worked with the man’s family to stop his behavior. He seemed to be drunk at the time, police said, adding no physical harm resulted from the confrontation. The man’s reaction has caused a storm of disapproval from Facebook users over the past day.